China is the biggest source of migrants to Australia, surpassing New Zealand for the first time in 2009. Between July and October 2009, 6,350 migrants arrived in Australia from China, compared to 5,800 from Britain and 4,740 from New Zealand. There are enough Chinese in Canada that Chinese is now the third most widely spoken language there after English and French. 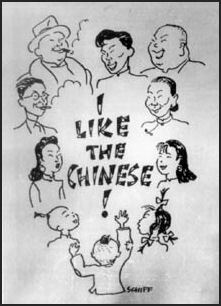 Chinese immigrants in Canada have a reputation for assimilating quickly. There are examples of Chinese who speak both Mandarin and Cantonese that choose to speak English when the meet. When asked why she preferred speaking English to Chinese-speaking customers, a Chinese-speaking waitress told AFP, “That’s what we speak here.” In a study by Canada Statistic in 2003, 76 percent of Chinese immigrants said they felt strongly attached to Canada and 58 percent said they also strongly identified with their own ethnic and cultural group. In Vancouver, one in five of the city’s 1.9 million people come from China. In the nearby town of Richmond, nearly half of the residents are of Chinese origin. Contrary to popular relief, not all Chinese come to North America for economic opportunities. One Richmond resident who had to borrow money from relatives to buy a house in Canada told AFP, “Our level of living is worse. We had no financial problems in China.” On why she came, she said, “I wanted to change my life.” She said she was “quite happy” with her new life in Canada. Beginning in the mid-1800s and continuing to the early-1900s, large numbers of Chinese, mostly from the Guangdong Province around Canton, emigrated to the United States, Canada, South Africa and Australia. They were lured to these far away places by stories of gold and opportunities and were prodded out of China by war, famine, chaos and poverty. Most of the Chinese found in Chinatowns today around the world still speak Cantonese. Large numbers of Chinese live in Southeast Asia. They are sometimes called "Asian Jews" because they started businesses, retained their customs and have become very rich. The economies in Malaysia, Indonesia, Singapore, and Thailand for the most part are controlled by rich Chinese. Although some live in rural areas, the vast majority of Chinese in Southeast Asia live in urban areas. Sometimes they live in separate Chinatowns. Chinese in Southeast Asia (percentage of population): 1) 6 million in Malaysia (34 percent); 2) 6 million in Indonesia (3 percent); 3) 6 million in Thailand (14 percent); 4) 2 million in Singapore (76 percent); 5) 1 million in Vietnam (2 percent); 6) 600,000 in the Philippines (1 percent); 7) 300,000 in Cambodia (4 percent); 8) 25,000 in Laos (0.8 percent). These numbers do not always reflect the full extent of Chinese presence. Partially assimilated Chinese are often not counted as Chinese. Companies controlled by ethnic Chinese are very powerful all across Asia, with the exception of South Korea and Japan. The economic clout of the Chinese in Taiwan, Hong Kong and Southeast Asia would rank forth or fifth in the world after the United States, Japan, China and possibly ahead of Germany. The first Chinese to enter Southeast Asia were Buddhist monks, maritime traders and representatives of the Imperial Chinese government. In ancient and medieval times, Chinese traders utilized Southeast Asian ports on the maritime Silk Road but at that time much of the trade conducted in the region was carried out by Arab mariners and merchants. Regular trading between China and Southeast Asia didn’t really begin in earnest until the 13th century. Some Chinese were attracted by trade opportunities in Malacca, Manila, Batavia (Jakarta) and other ports. Some of the most detailed descriptions of Angkor Wat and other Southeast Asian civilizations came from Chinese travelers and monks. Beginning in the late-1700s, large numbers of Chinese---mostly from Guangdong and Fujian provinces and Hainan Island in southern China---began emigrating to Southeast Asia. Most were illiterate, landless peasants oppressed in their homelands and looking for opportunities abroad. The rich landowners and educated Mandarins stayed in China. Scholars attribute the mass exodus to a population explosion in the coastal cities of Fujian and prosperity and contacts generated by foreign trade. So many people left Fujian for Southeast Asia during the late 18th century and early 19th century that the Manchu court issued an imperial edict recalling all Chinese to the mainland and declaring that anyone who didn't return and was captured would be executed. Most of the Chinese who settled in Southeast Asia left China in the mid 19th century after a number of treaty ports were opened in China with the signing of the Treaty of Nanking in 1842 after the first Opium War. The ports were convenient departure points. With the British rather than imperial Chinese running things there were fewer obstacles preventing Chinese from leaving. British ports in Southeast Asia, particularly Singapore, gave them destinations they could head to. A particularly large number of Chinese left from the British treaty ports of Xiamen (Amoy) and Fuzhou (Foochow) in Fujian province. Many were encouraged to leave by colonial governments so they could provide cheap coolie labor in ports around the world, including those in colonial Southeast Asia. Many Chinese fled the coastal province of Fujian and Zhejiang after famines and floods in 1910 and later during World War II and the early days of Communist rule. Many of the legal and illegal immigrants from China scattered around the globe continue to come from Fujian. Of the Chinese who went abroad, some returned, some died under harsh working conditions but many stayed on and were able to prosper under European colonial rule. Many of those who initially did well acted as middlemen between the Europeans and Southeast Asian producers and consumers. The Chinese thrived under colonial rule. In French colonies laws discouraged participation in commerce by the native population but encouraged Chinese participation. In the British-controlled Malay states the Chinese managed the lucrative opium farms and controlled opium distribution. In Indonesia, the Chinese collected taxes and worked as labor contractors for the Dutch. Over time, the Chinese became moneylenders and controlled internal trade in the Southeast Asian colonies and countries where they lived. They also played various roles in the trade between Southeast Asian countries. Some accumulated great wealth and this encouraged other Chinese in China to follow in their footsteps. Overseas Chinese worked as shop owners, traders, and middlemen; became involved in wide variety of businesses; and founded family businesses and international firms. By the late 19th century they controlled much of the commerce in Thailand, Malaysia, the Philippines, Cambodia and Indonesia and ran companies that did business throughout the Asian-Pacific region. In her book “Paper Sons and Daughters: Growing up Chinese in South Africa”, Ufrieda Ho’s compelling memoir describes with intimate detail what it was like to come of age in the marginalized Chinese community of Johannesburg during the apartheid era of the 1970s and 1980s. The Chinese were mostly ignored, as Ho describes it, relegated to certain neighborhoods and certain jobs, living in a kind of gray zone between the blacks and the whites. As long as they adhered to these rules, they were left alone. Ho describes the separate journeys her parents took before they knew one another, each leaving China and Hong Kong around the early1960s, arriving in South Africa as illegal immigrants. Her father eventually became a so-called “fahfee man,” running a small-time numbers game in the black townships, one of the few opportunities available to him at that time. In loving detail, Ho describes her father’s work habits: the often mysterious selection of numbers at the kitchen table, the carefully-kept account ledgers, and especially the daily drives into the townships, where he conducted business on street corners from the seat of his car. Sometimes Ufrieda accompanied him on these township visits, offering her an illuminating perspective into a stratified society. Poignantly, it was on such a visit that her father—who is very much a central figure in Ho’s memoir—met with a tragic end. Getting a foreign passport is like “taking out an insurance policy,” said Rupert Hoogewerf, who compiles the Hurun Rich List, China’s version of the Forbes list. “If there is political unrest or suddenly things change in China---because it’s a big country, something could go wrong---they already have a passport to go overseas. It’s an additional safety net.” Nearly 60 percent of the people surveyed said worries over their children’s education are a reason for wanting to leave. “All but a few are from around of Wenzhou, a port in south-east China, and are drawn to Italy by an industry created from scratch in less than 20 years,” Hooper wrote. “Pronto moda involves importing cheap fabric, usually from China, and getting it made up to order at breakneck speeds into high-fashion garments that are then sold with "made in Italy" labels. Surong Badeng from Xinjiang, a police interpreter, said the Chinese community worked hard through choice not exploitation. "They come to Italy to make money and have no time to integrate. They are ready to make huge sacrifices to get rich," he said. Pieraccini told AFP the workers live in the warehouses because they labor 18 hours a day and sleep where they drop. "The Chinese work a great deal, they are very quick to understand where the market is going, but they work in deplorable conditions, without contracts and in buildings that are unsafe and often unhygienic" she said. "The Chinese textile sector makes a huge profit and it's obvious that the possibility to make large amounts of money is bound to attract criminals." Hu Qui Lin is famous in Prato for being the only Chinese company owner (among between 4,000 and 5,000) to have joined Confindustria, the Italian bosses' federation.His managing director, like many of his other employees, is Italian. Giancarlo Maffei is also an adviser to the centre-left provincial government. “At the main hospital in Prato, 32 percent of the children born have Chinese mothers,” John Hooper wrote in The Guardian. “Whatever their legal status, those children will grow up Italians. Already, you can see around town Italianized Chinese teenagers, the girls particularly conspicuous in their chic, often provocatively cut outfits and heavy makeup.” "The ones who are born here dress like Italians, eat like Italians and don't speak much Chinese," says Hu Qui Lin. Dutch-born Yun Yin Lee, visiting Prato as a tourist, says: "The police here look at me in a way I've never been looked at in Holland." Last month saw impassioned protests from immigrant representatives after the mayor refused to declare an official day of mourning for three Chinese drowned in floods. Cenni, Prato's mayor, insists that the police crackdown to clean up the textile industry is about protecting exploited Chinese. "We want to get closer to those who are being exploited in the hope that we can persuade them to rebel," Cenni said. That is not the way the Chinese embassy sees it. "It's wrong of Italy to carry out raids with helicopters and dogs, it's completely over the top. We're not at war, this is a civil country," Tang Youjing, a counsellor at the Chinese embassy, told AFP in an interview. Referring to the city's struggle to regain its status as the main center for the Italian textile industry in the wake of the financial crisis, Tang said: "The Chinese are helping Prato to resolve its economic problems." Cooperation Between Chinese and Italians in Life in Italy's Little China? Maffei argues that this is starting to happen. "Tens of millions of meters of fabric are already being bought by the Chinese from Italian firms," he says. In October 2010, a delegation from Wenzhou signed an agreement with the provincial authorities to encourage firms back in China to buy high-quality textiles from Prato and wine from the nearby Carmignano area. The ceremony was attended by Mayor Cenni, but he declined an invitation to put his own signature to the document.